the California Space Grant Consortium. The development of the "My Daughter is an Engineer" program was based on the recognition that parental support is critical to young girls’ academic success in engineering. This 3-day summer residential program was designed as a unique live-and-learn experience for the father or mother and the daughter to explore the world of engineering together. Participants include high-achieving pre-middle school girls and a parent. While residing at the CSULB campus to experience dorm life, they participate in a variety of activities, focusing on engineering in everyday life by building/controlling a small robot. Conceived by Lily Gossage, founder of "Women Engineers @ the Beach," this program was held for the first time in 2011. Funding is provided by IEEE Control Systems Society (via Dr. Bei Lu as Principal Investigator and Dr. Panadda Marayong and Lily Gossage as Co-Investigators) and the California Space Grant Consortium (via Lily Gossage as Principal Investigator and Dr. Eric Besnard as Co-Investigator). 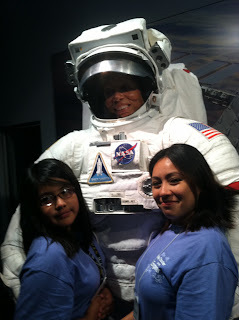 The Women-in-Engineering Outreach team encourages fathers to get more involved with their daughter's academic growth. Program dates: July 5-7, 2013. 13 daughter-mother pairs, 2 daughter-father pairs, 7 K-12 educators. 2013 group at the CSULB dorms. 2013 group at the Columbia Memorial Space Center. Program dates: July 6-8, 2012. 18 daughter-mother pairs, 1 daughter-father pair, 20 K-12 educators. 2012 group at the Center for Human Factors in Advanced Aeronautics Technologies. Program dates: July 8-10, 2011. 14 daughter-mother pairs, 10 K-12 educators. 2011 group at the CSULB Japanese Garden. As part of this enriching engineering experience, the program combines professional development of K-12 educators and advocates. 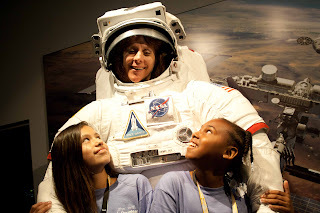 Educators, whose participation is funded by the California Space Grant Consortium, participate along-side parents/daughters but also receive additional workshop/activities related to aerospace engineering, including content based on NASA Directorates (i.e., aeronautics, exploration systems, science dealing with astrophysics/heliophysics). 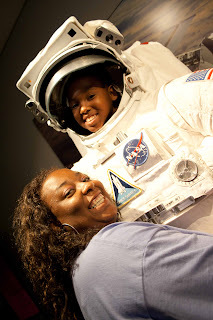 Click on "astronaut" image to view over 200 photos taken at the Columbia Memorial Space Center.